As the army's highest rated commando, you must ensure that each mission is a success by providing the initial air support that will become absolutely necessary to the army's safety. 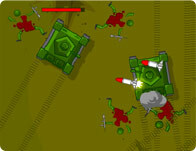 Dodge the tanks and helicopter fire, and wreck as much havoc across enemy lines as you can! Grab power-ups for quick boosts of energy and gather experience to permanently upgrade your plane to rain fire down on your foes! Use the arrow keys to dodge and collect powerups and fire missiles.